Watching scary movies is a common tradition most people practice around Halloween. After all, nothing quite screams Halloween like sitting in the dark and munching on a bucket of popcorn as you watch scary flicks. Did you know that your favorite horror movies have their own crazy stories about things that happened behind the scenes? Before you start this year’s scary movie marathon, check out these 10 wild and crazy facts about your favorite horror movies. To add these movies to your personal collection, sign up for iRazoo and start earning free points that can be redeemed for gift cards to retailers such as iTunes, Amazon, and more! Stephen King was openly displeased with Stanley Kubrick’s version of “The Shining.” King felt that many scenes in the movie fell flat, and that the casting of Jack Nicholson as the lead character was a poor choice. Today, the movie is featured in Rolling Stone magazine’s 10 Best Horror Movies of All Time. Michael Myers’ infamous mask in “Halloween” is a stretched-out Captain Kirk mask. The movie’s production designer purchased the mask for $2 from a local toy store to fulfill the script’s need for a mask that had the “pale, neutral features of a man.” The alternate choice would have been a mask for a clown character made popular by actor Emmett Kelly. Drew Barrymore was originally slated to play the lead role in “Scream” that eventually went to Neve Campbell. Barrymore changed her mind weeks before production and asked to play the minor role of the character killed in the opening scene. The actress wanted to trick audiences into thinking her character would survive. To ensure the Wicca featured in “The Craft,” was completely authentic, the filmmakers consulted with a real witch named Pat Devin. Devin is a member of Covenant of the Goddess— one of the oldest and largest Wiccan organizations in the U.S., and says that the production team used many of her suggestions for the final cut. The killer shark in “Jaws” isn’t featured in the movie until the 81-minute mark. This is because the mechanical shark rarely worked during filming, and director Steven Spielberg had to find other creative ways to film without having to feature the shark as much. “Carrie” film director Brian De Palma only allowed Sissy Spacek to audition for the lead role out of courtesy to her husband, who was the film’s art director. Spacek used Vaseline to slick her hair back and wore an old children’s dress to the audition. The rest is history. At the beginning of every day on set, the movie’s production team programmed stop points in GPS trackers so the actors could find milk crates containing that day’s acting instructions. The actors were prohibited from sharing their instructions with one another, since their job was to improvise accordingly. 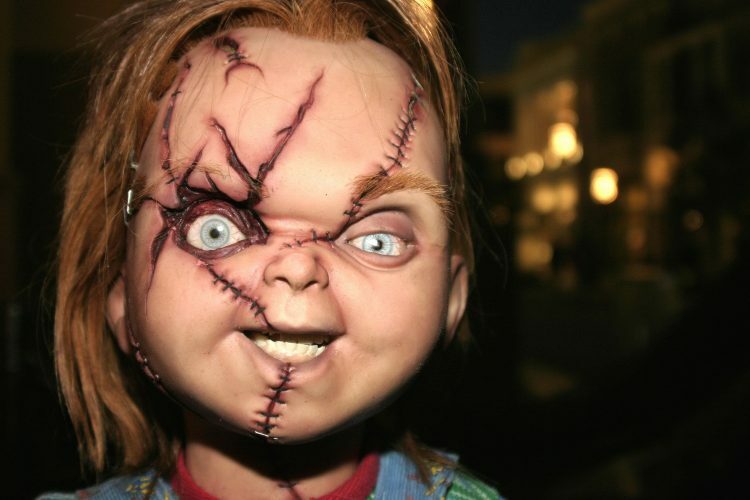 The terrifying Chucky doll from “Child’s Play” is based on a real toy called Robert the Doll. The doll belonged to a painter and author named Robert Eugene Otto, who in 1909, said it had been cursed by a family servant and was moving around on its own. Today, that very doll is on display at the Custom House and Old Post Office in Otto’s hometown of Key West, Florida. “The Shining” director Stanley Kubrick used his own typewriter to create the giant stack of 500 pages that read “All work and no play makes Jack a dull boy.” Though Kubrick never confirmed before he died whether he manually typed all 500 pages, some insist that the act was characteristic of the director. Plan on staying in with your favorite horror flicks this Halloween? Get your favorite scary movies for free using gift cards from Amazon.com, iTunes, and PayPal! Sign up for iRazoo today and watch videos or complete surveys to earn points. Then, redeem your points for free gift cards to your favorite retailers.